Most people never get training in the key concepts of negotiation, yet it is one of the most essential skills in business and in life. We are constantly negotiating – to get bigger, better deals in our favor – and to do so we must learn how to approach it from a position of power. In How I Do Business, I took my years of studying and direct experience in negotiation and translated it into some base components, breaking down what it takes to become a great negotiator and the pitfalls to avoid. Whether you’re a novice to the art form or an accomplished negotiator looking to augment your skills, you can always learn more techniques to take your business to the next level. Successful business negotiation means maximizing the meeting of your interests. You are striking an agreement with another person, and while you want this agreement to benefit both parties, you also want to get the most out of it. But here is the paradox: In order to get the most that you can, you must also meet the other person’s interests. To get all that I want, I have to give you what you want. When you hold negotiating power, it is easier to get what you want, and give the other person what they want. First, it’s important to understand the three principles of negotiation. Desire: Both parties must desire something from one another before negotiation begins. Agreement: You have to care about the outcome – but not too much. No fixed rules regarding the negotiation: There will always be some rules, like if you and I are negotiating for me to buy your car, we will probably both have our clothes on and be making the exchange in money. But with regard to the value of the car and how we enter into negotiations? There are no fixed rules. How does power negotiation work? Power negotiation is a game of addition, not subtraction. It’s about problem-solving instead of arguing, as well as seeing another point of view. So why is negotiation so challenging for many? One of the principles of negotiation is knowing the difference between position and interest. In a position-based negotiation, I say something, prompting you to defend your position. This makes me defend my position. Now our egos get involved and there is nowhere to go but deeper into an argument. Negotiating power comes from a point of interest – the thing that drives you, or the goal you desire. Why do you want this thing, and why do you deserve it? You must approach each negotiation knowing what you’ll achieve by obtaining this agreement. Example 1: Let’s say I have been dating a woman for several years and I’m very much in love with her. So I ask her to marry me. Is that a position or an interest? Right now, it’s just a position. But if I say, “I want you to marry me, to be my life partner, to grow old with me,” then I have given her a reason. I have told her why I want to marry her. This lets her make a better decision to get the outcome she desires. Here the broker takes your position – you want to buy a house – and immediately starts to find out your interests. The more they know about what you want and need, the better equipped they are to meet your expectations. And if they successfully meet your expectations – by showing you a house you eventually purchase – then they get their fee. It’s a successful negotiation for both parties. The next time you start a business negotiation, remember that your positions are your actions, but your interests are what influence your actions. Most of your unsuccessful negotiations were probably centered on positions, not interests. But when you enter into a negotiation and focus on the interests of yourself and the other party, you’ll resolve things without much trouble. When things go smoothly, the chances of everyone getting their interests met go up dramatically, resulting in a successful negotiation. About the author: American entrepreneur, international speaker and acclaimed author, Keith Cunningham is regarded as one of the foremost authorities on business mastery. 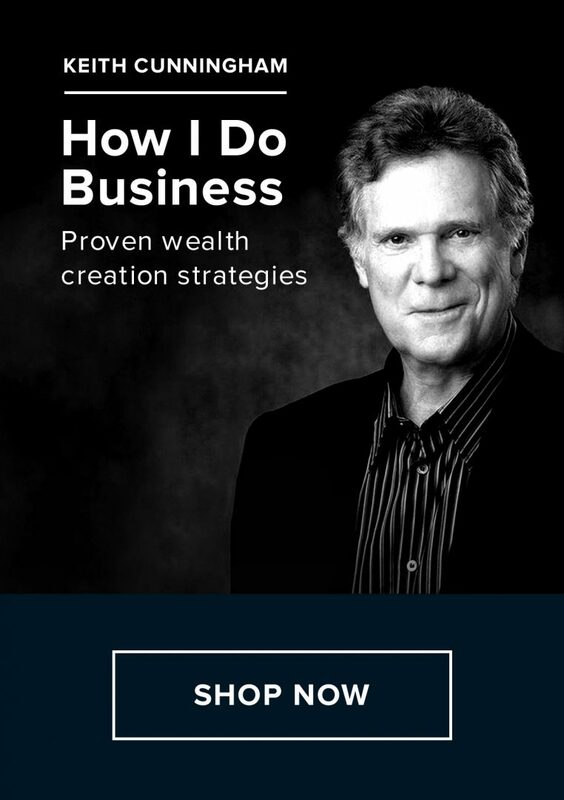 With more than 40 years of business and investing experience, Keith has taught critical business skills to thousands of top executives and entrepreneurs around the world.